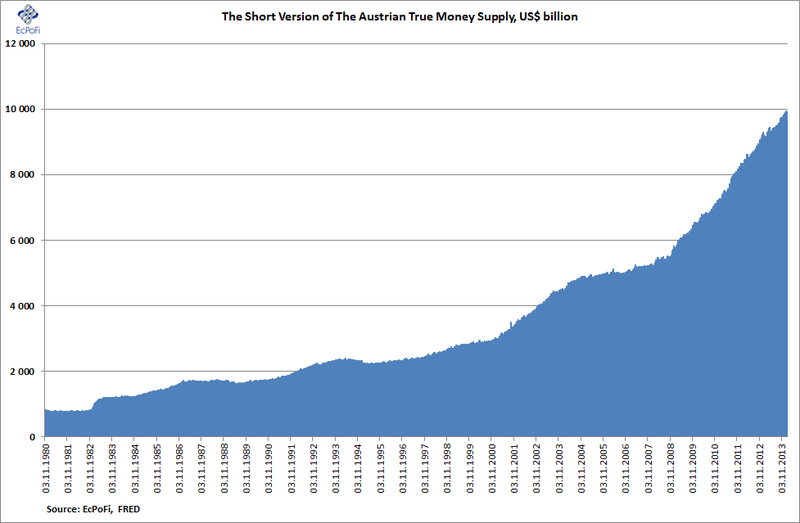 The short version of the Austrian True Money Supply (SVTMS) for the U.S. increased by 0.43% (24.99% annualised) during the most recent week ending 10 February to reach US$ 9.9047 trillion calculated from the most recent monetary statistics published by the Federal Reserve. The 1-year growth rate in the money supply increased to 7.94%, up from the 7.75% reported last week. This was the highest growth rate reported for 11 weeks (since week ending 24 November 2013). The growth rate remains significantly lower than it was a year ago so the trend in the 1-year growth rate continues to decline. In fact, this was the 85th week in a row with a growth rate which was lower than the same period the previous year. The 5-year annualised growth rate in the money supply ended the week on 11.20%, the lowest reported since week ending 24 September 2012. The growth rate declined for the 10th consecutive week compared to the same period last year demonstrating a falling rate of growth for the 5-year growth rate as well. 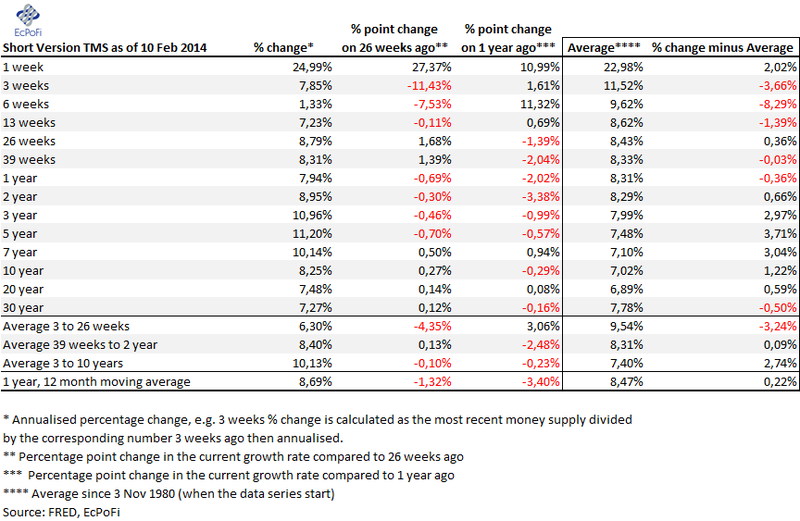 Ignoring the shorter term growth rates (1- to 13-weeks), all the growth rates except for the 7- and 20-year growth rates in the table below are lower than they were one year ago. 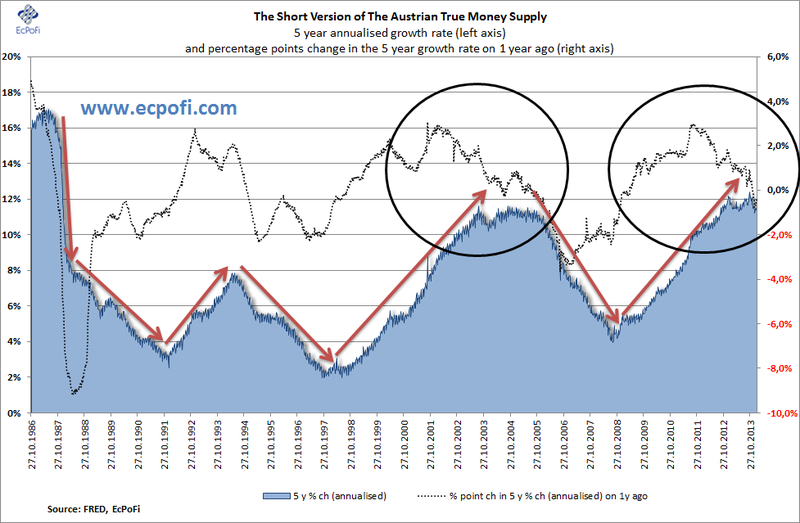 This indicates that the overall growth rate in the money supply continues to slow down. 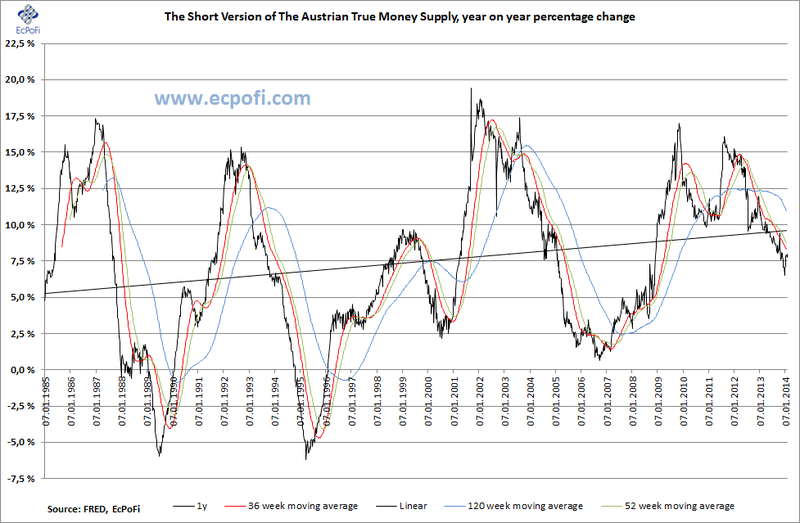 Click here to access the the short version of the Austrian True Money Supply archive.